This session, available by booking, is offered either for one person, either for groups. It can cover the whole day sharing a healthy lunch or a minimum of three hours (morning or afternoon). 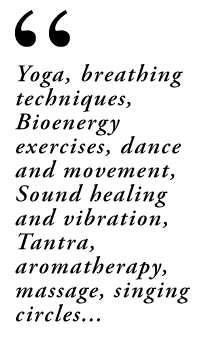 The subjet for this intense journey is combined and adapted to your choice: Breathing, Chakras, Yoga, Sound and Voice, Women circles, Aromatherapy, Circle of light (Tantric breathing).